InsightSquared Sales Analytics Review: "Fantastic tool for growing sales teams!" Fantastic tool for growing sales teams! InsightSquared Sales Analytics Review: "Analytics made easy"
We use InsightSquared for the marketing, sales, management and finance departments. We use the tool to track marketing attribution to pipeline and won deals, by channel, CVR, velocity, and more and make sure marketing hits our target numbers. We also use it in sales to track activity, attribution, forecasting, and CVR. Management and finance use the tool to project spend, goals, forecasting, and hold the marketing and sales teams accountable, see progress, and see where we need more work. Cross-object reporting in conjunction with Salesforce allows us to see a broader analysis of our database as a whole (leads, contacts, opportunities...). Retroactive reporting so that we can see at any given time in history what leads hit what success, which Salesforce lacks. Emailable dashboards filled with customized reports. Deciding what type of report for what use case is confusing. Perhaps the naming scheme needs to be updated to follow more what Salesforce uses. Customizing reports on filters sometimes requires help from support based on how customized you need it. Regular check-ins about new features, how to use the tool, etc. would help with adoption. We use InsightSquared every day to see how many qualified leads are coming in, and from where. That way we can allocate dollars to the channels that convert quickest. InsightSquared Sales Analytics Review: "Great tool for visibility and accountability into sales data"
We are currently using InsightSquared in many aspects throughout the sales organization. Everything from leaderboards to create transparency and motivate individual contributors to executive dashboards for overall sales performance reporting. I like InsightSquared because of the visibility and insight it gives other departments into the sales team. Our managers even use InsightSquared dashboards for coaching sessions. InsightSquared has given us the ability to easily drill-down into our data and make our Salesforce data actionable for the individual, the manager, and the executive team all at once. InsightSquared is perfect for a sales team that is looking for actionable insights that look better than a standard Salesforce report or dashboard. Teams that need leaderboards and visibility into sales data will love InsightSquared. Teams that have data analysts processing data and performing more sophisticated analysis on data, will be frustrated with the basic version of InsightSquared. To make the product effective for those groups, you will want to purchase the additional feature/product called Slate. Slate will allow you to connect in other BI tools and use that data in InsightSquared dashboards and reports. InsightSquared Sales Analytics Review: "Best Sales Analytics Tool for Salesforce users"
Absolutely essential taking full advantage of your Salesforce deployment and tracking how your sales team members are operating. Without this type of visualization tool, it is very hard to show trends or patterns that exist in your Salesforce data. When establishing a Sales Operations role in our organization the tool was critical to identify keys problem areas that were then resolved by implementing new processes or training programs.Sales Management has adopted the dashboard as a vehicle to deliver performance feedback in 1x1 meetings with team members. Essential if you are using Salesforce and want to visualize the data that you are tracking for sales performance and operations. InsightSquared Sales Analytics Review: "Best reporting tool for staffing agencies!" The entire organization uses InsightSquared to view activity metrics and results. We rely on it to see how we are doing and make business decisions. It is integrated with our ATS/CRM application. (Bullhorn) It also provides us with data on how are people are doing with phone activity. Can't imagine not having it. They understand the staffing industry and how we look and consume data. They have the best customer service and they are extremely innovative. InsightSquared Sales Analytics Review: "InsightSquared for the Financial Analyst"
InsightSquared is primarily used by managers and our executive team to monitor sales progress. It allows for sales, management, and finance to clearly see results, and investigate ad-hoc questions. It is a great resource for sales managers during one-on-one rep meetings to see where the rep stands in regards to quota coverage, pipeline, and historical performance. Quick and easy data solution of executive team. They can use their phones to view the IS2 app. Intuitive platform that can be picked up easily by new hires. Numerous Filters that allow for quick answers to ad hoc questions. I am an analyst at a SaaS company. It is a great tool to understand historical trends and predict future performance. InsightSquared also allows you to create and share a dashboard that can give management insight into key metrics, without having to do the analytic work themselves. There is also a prebuilt SaaS dashboard that can be used. InsightSquared Sales Analytics Review: "Easy to use and very detailed analytics into pipeline"
We use InsightSquared to manage our pipeline as well as sales activity. The reports and dashboards facilitate our weekly forecast call and the one on one's with the sales manager and our sales reps. It is being used primarily by our sales group but other groups such as our marketing and business development teams leverage specific reports. There are a lot of detailed reports that come standard and really help us manage our pipeline. For example, the pipeline inflow/outflow report is an excellent indicator of the current status of our pipeline. I also find the newsfeed really helpful as it aggregates the risk factors of our entire pipeline. InsightSquared Sales Analytics Review: "Great tool!" Our sales team uses it on a daily basis. We view pipelines as a team and an individual, forecast, trend data, stuck deals and benefit from many other insights that the tool has to offer. It addresses the business problem of objective visibility. We can now put some data behind how a deal is truly trending rather than just gut feel. Their momentum report is one of my favorite reports. It gives an objective look at which deals have had a lot of activity on them recently and provides a good focus. Detailing what each report means, very helpful. Great interface and easy navigation. Maybe an improvement on the load time for some of the reports, not bad overall and not something that ever detracts from the core functionality of the product. Nothing else that comes to mind! In-depth look at pipelines and deal trends are where this tool shines for our team. We can very easily understand how are efforts are affecting our pipeline. Because of its customization abilities, I don't know that there are too many scenarios that it wouldn't be of great benefit to an organization. InsightSquared Sales Analytics Review: "InsightSquared gives us all the Insight we need to be successful!" InsightSquared is used to support insight and analytics across our sales and customer success teams. It allows us to have deeper level insight, specifically for our sales org to understand how every rep is performing against their goals. It allows us to get more in depth insights from our Salesforce data with great visualizations. The ability to create various dashboards for different teams or metrics is incredibly useful. The integrations available to pull in information from places like Zendesk and Salesforce is crucial in reporting from one place. The complexity of the reports you can create and how it seamlessly flow from your Salesforce data is incredibly helpful. Additional integrations could be very useful, including a unique integration specifically with our own database would be incredible. The UI could be improved to make certain aspects of the product more user-friendly, especially for team members who may not be data minded. It has allowed me to share metrics with management and execs as well as keep the company updated on a daily cadence with the use of our dashboards being displayed throughout the office screens. InsightSquared Sales Analytics Review: "Great product for small business"
Our company uses InsightSquared to track and analyze sales metrics within our recruiting activity. We are a four person technical recruiting agency and it is used by all four members of our team. It has been great for looking at metrics across the two years of our existence to find data trends as well as analyzing current data to see how we are stacking up against previous quarters. The user interface is very logical and easy to use. The graphs and charts really help for visual learners. The amount of data you can analyze is massive! You can run a report or create a dashboard for just about anything. It seems like there are times where we can't figure out where the data is coming from. That could be user input errors. You can get overwhelmed by the amount of options available for report generation. Sometimes it is hard to interpret exactly what the data is saying. For instance, there is a funnel graph with percentages, but is the 90% related to the number directly above it or all numbers above? I can only really speak to how we use it within our niche, but for staffing it is super important to track number of submittals to placements, and other metrics related to how efficiently we need to work. These things are really easy to track with InsightSquared. I think questions that should be asked need to revolve around the specific data it is important to capture, and how the product can manipulate that data. InsightSquared Sales Analytics Review: "Easy to understand and gain useful insights for users"
We use it across the company. It's great to see our current position, trends, development and forecasting. As a Sales consultant it is a great way to quickly see my performance, how I do in comparison to my colleagues and how close I am hitting my targets. The dashboard gives you all the info in one easy to understand page. Furthermore, "The Lab" makes it possible to forecast how much commission I should make for any time frame selected. I also think that the newsfeed is a great way to get selected data sent in an email instead of having to log into the InsightSquared website. InsightSquared works great for the recruitment industry. We tested it extensively during the free trial. It integrates well with Bullhorn CRM. InsightSquared Sales Analytics Review: "An amazing tool for Analytics and Insights"
InsightSquared Salesforce Analytics have transformed our sales team and how we do business. The Dashboards are intuitive and the predictive modelling is incredibly helpful. As an account manager in sales, having a strikezone list, seeing the numbers in my pipeline, highlighting at risk opportunities etc., makes my job easier! It works well for understanding your own uses of Salesforce and then matching InsightSquared to give you the best results. It can take some tweaking but once it is up and running, it will be smooth sailing from there. The support team is very helpful! InsightSquared Sales Analytics Review: "Great analytics tool!" Currently, we are using InsightSquared primarily for the sales department of our software solution. We hope to be able to use it across the entire firm in the next year or so. It is helping us to better forecast our sales. We have also started to use it to get an idea of how often sales opportunities are being pushed in the pipeline instead of being closed as a loss. We are at the beginning of figuring out all that InsightSquared has to offer, but it has been immensely helpful in seeing our data in different ways to assist us in the process of cleaning. I love the flexibility that InsightSquared has to offer. We have a number of Salesforce fields that are used in different ways because we aren't strictly a sales company. They have been helping us from the beginning to figure out the best ways to organize our data to get the information we're looking for. The Dashboards within the system are great. I wish we used them better than we currently do, but that is a growth area for us. As the admin, I have the capability to setup dashboards for different users who may not be as tech-savy. This is huge because I can play around with them and experiment before we implement for the user. I know this is something they have in process, but I would love to be able to customize reports myself. The support team is always super responsive and makes sure that we're taken care of. But, it would be great to just be able to log in and change the small things myself. I recently downloaded the InsightSquared app to my phone, and I'd like to see more functionality there. Currently. You are only able to see dashboards that have a already been created. I wasn't involved in the selection process for this system, so I am not sure what some of the key questions might be. I can tell you that I think it's definitely more appropriate for companies that are more sales driven. We are an accounting firm, and though business development is a huge part of our business the sales model is very different from the typical sales company. I do think that the flexibility of the InsightSquared system is what has allowed us such success in using it. InsightSquared Sales Analytics Review: "InsightSquared - a fantastic tool for almost any sales environment"
InsightSquared is used by our sales department and company management to track overall sales performance, individual sales performance and assist in meeting our predefined sales targets. It provides visibility into our targets which is not afforded to us by Salesforce, through which the data is pulled. It provides a clear and easy way to assess the method of ranking the sales performance of individuals against each other. If all of your data isn't consolidated in one place, this product is less appropriate. If your company or team structure isn't yet developed to the point where you have well defined sales targets based on historical data and accurate forecasting, many of the benefits of Insight Squared's data analysis could be lost on you. Ask yourself first if your sales team is at the point where you're ready to utilise data analytics to scale your sales effectively. InsightSquared Sales Analytics Review: "A great tool for success for any sales professional"
It is used mainly to track our sales performance. InsightSquared helps us analyze our sales metrics, the amount of revenue we are bringing in, close rates, pipelines, and all other useful stats that keep a sales professional motivated, focused, and very aware of their goals. Sales metrics: see how you are comparing to your peers, from every possible angle. InsightSquared gathers all the data you need to know, want to know, and didn't even know you wanted! Predictive statistics and the likelihood of a deal to fail or succeed is quite useful in a sales environment where time efficiency is key. Need to know what deals to focus on? You can see exactly what deals need more TLC, which ones are likely to close, and which ones to stop wasting time on. I loved how you can chose filtering options, in our particular sales environment, but the updates you just released completely changed it and made it difficult to sort through the multiple filtering variables we have in place. Actively provide more demos on feature updates perhaps? Again, this is a very powerful tool but if a sales team doesn't know how to use it to it's fullest potential, then it's not worth the $$$. Make sure you are in contact with your clients and their growing teams are not only comfortable using InsightSquared, but it is an integral part of their sales success. -What data is most important for your team to see on a regular basis? -What metrics is the sales team being graded on? -What tools do you currently have in place that can feed into InsightSquared? You need to make sure you already have a sales environment that is set and InsightSquared will basically report on it's performance. InsightSquared Sales Analytics Review: "Salesforce is great." Over half of our staff is using Salesforce Analytics. I love how I can run a report for something I used to track manually. InsightSquared Sales Analytics Review: "All around great product with exceptional customer service!" Our primary goal for using InsightSquared is to better understand and manage the pipeline of potential loans for our lending department. With over 600 reports that are simply not possible to create using native Salesforce analytics, I can analyze our organization data in all new ways. The reports available in InsightSquared provides insight into individual and overall portfolio performance and help us identify actionable areas for improvement. The suite of reports offered are excellent! It allows us to analyze our lead and opportunity data in ways that are not possible with native Salesforce analytics functionality. The user interface is aesthetically pleasing and easy to use. This is not a given for many applications and increases the likelihood of adoption. InsightSquared has excellent customer service. With enterprise edition, we have a designated customer support person to answer any of our questions and ensure that we are happy with our overall implementation. I'd love to see the user interface available in other languages, especially Spanish. As an administrator, I would like to be able to make more customizations myself. I believe this is on their roadmap. When I create a new user in Salesforce, I would like to be able to force InsightSquared to update and immediately enable the new user rather than wait for the normally scheduled update to appear in their system. Right now, it takes about a day for the new user to appear in InsightSquared. InsightSquared is currently configured to analyze your Salesforce lead and opportunity data. If you are not using these standard objects to manage your sales pipeline, then their product would likely not be appropriate for your business. During the selection process, I recommend taking advantage of their free trial. With a free trial, you can begin the customization process and best determine whether their product will meet your needs. InsightSquared Sales Analytics Review: "Makes my Data Actionable"
InsightSquared is currently being used by both sales and marketing to improve the sales process and monitor trends in rep behavior / lead quality. We have been able to identify major gaps in behavior and also given the sales managers the tool they need to have these insights at their disposal for coaching. I love the easy to use format and how digestible the information is. Often times reporting, especially the ones as detailed as the ones they provide can be difficult to make sense of. The reports they provide make it very obvious to anyone what the actionable items are. Also being able to auto-send the reports daily is awesome. Improving Sales process. We have been able to identify major gaps in behavior and also given the sales managers the tool they need to have these insights at their disposal for coaching. InsightSquared Sales Analytics Review: "A great must have tool for me!" InsightSquared is being used across the sales organization, on both a team level and an individual level. It's an understanding of what our team / individual goals are, how we're tracking towards those goals, and a reminder of what we need to do to achieve those goals. It's incredible at increasing productivity, as well holding ourselves accountable for what we need to do. It's also a great complimentary tool to other CRMs and other enablement tools. It helps me to prioritize my tasks well. It keeps me on track to my sales goals. They provide easy to configure views and dashboards for easy sourcing of data. They have a tremendous support team w/ lots of best practices and educational content. At times there can be a lag in the reporting. If this continually updated in real time it would be even more powerful. But this is not a deal breaker by any means. It's well suited for any business looking to scale, or for fast growing sales teams. InsightSquared Sales Analytics Review: "All your statistics and data in a useful and easy to use system"
Throughout our company different departments make use of InsightSquared in different ways. InsightSquared delivers useful information. Within my team / department it is important to have a good overview of sales figures. This includes non financial figures pulled through our CRM system Bullhorn. This way we can keep up with our sales targets and at the same time view our financial stats which show us estimates of what our commission will look like. Dashboard - easy customization to get all the information in one place (this pulls through to the mobile app as well). My Reports - all my atargets and statistics easily accessible. The Lab - good overview of our financial targets, commissions etc. Data will take several hours to pull from our CRM system. If I see that certain things have been changed on our CRM system, it will still take several hours until I will be able to see this linked to the rest of my stats on InsightSquared. Contracts department: knowing when consultants will start / finish projects and when to chase clients. Finance: Good overview of finances of the company. Management: Good overview of your teams targets, finances, etc. Each sales consultant individually: Good overview of personal sales target and commission. InsightSquared Sales Analytics Review: "Awesome Product"
InsightSquared is used to track our data in Salesforce in an efficient and concise way. We can draw many insights from using the product. A lot of data is easily processed and put into reports quickly. We can look at sales data and activity history to pull levers in different ways. How often the data gets processed and updated is very important. Also knowing how much customization they can add themselves on the backend is very important. InsightSquared Sales Analytics Review: "Getting insights...squared." We use InsightSquared to better understand how our sales work. As a quickly growing team, we are constantly facing new challenges and need to find ways of assessing our sales teams. InsightSquared helped us to get away from the dreaded Salesforce Report creation, to a beautiful and useful user interface that comes with reports that are helpful out of the box. The ability to quickly filter, alter and manipulate reports is a huge plus: We can get data in real time without having our sales ops person going back and rewriting a Salesforce report. It helps us to save time and quickly see changes and challenges in our day to day business. Understand other factors such as churn, sales cycles and sales funnels. InsightSquared is perfect for quickly growing businesses. As long as business intelligence is not big enough to be a department, don't bother with Salesforce Reports but use InsightSquared instead. I feel every business with less than 200 employees can greatly benefit from IS2. The main question is: Do I take data driven decisions and do I have time to write long and dull Salesforce reports? InsightSquared Sales Analytics Review: "Awesome sales tool"
InsightSquared is highly utilized across our sales organization to provide us with realtime feedback on our sales progress. It also provides us with powerful analytics on our leads and allows us to manage our pipeline a lot better. With the live leaderboard, sales representatives are more competitive and this helps drive sales. InsightSquared tracks numerous metrics which ultimately help us make better sales decisions. InsightSquared Sales Analytics Review: "Great Product!" 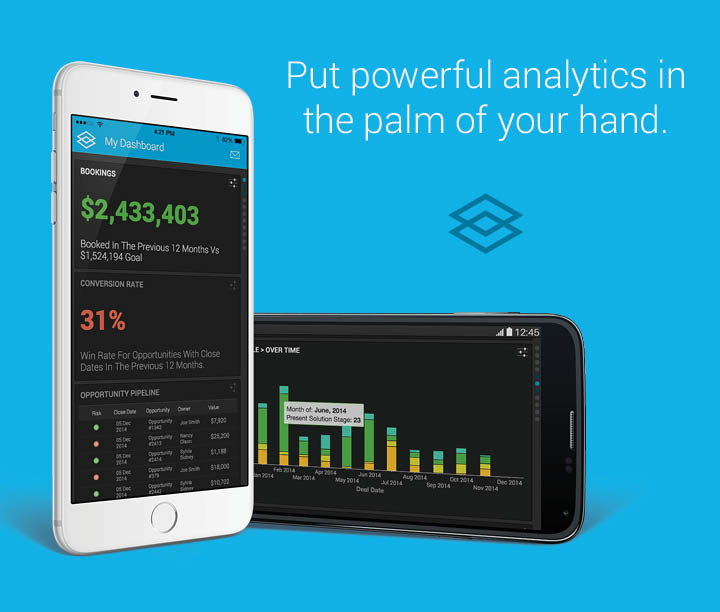 Salesforce Analytics with Insight Squared is fantastic. It helps me make data driven decisions so I never miss an opportunity for a sale! I wish it updated in real time. It's a life saver--without Insight Squared it would be impossible to prioritize. InsightSquared Sales Analytics Review: "Great Platform!" We use InsightSquared for our department to help keep our team on track with our targets. I love the filters for my reports. It could be faster when updating, I find it takes a few hours to update. I like that I can see my overall activity so I can see my progress for the month and track it properly. InsightSquared Tiles is a sales analytics platform that provides sales leaders with the insights they need to drive performance and close deals. According to the vendor, the comprehensive set of reports provide sales leaders with ready access to all the analysis they need to assess their progress, diagnose performance gaps, and formulate action and coaching plans. Additionally, the vendor says their solution provides a single version of the truth for finance, sales and marketing teams, which enables companies to make better decisions. Pull in data from multiple sources to get a 360° view of your business.Share presentation-ready reports with your team or your Board of Directors.Eliminate noise, and go beyond lists and pivot tables to get deeper insights.Draw links between different data elements, and see connections across your data sources.Follow the Newsfeed, and never miss the headlines.